TEMPE – Longtime Phoenix activist Rev. 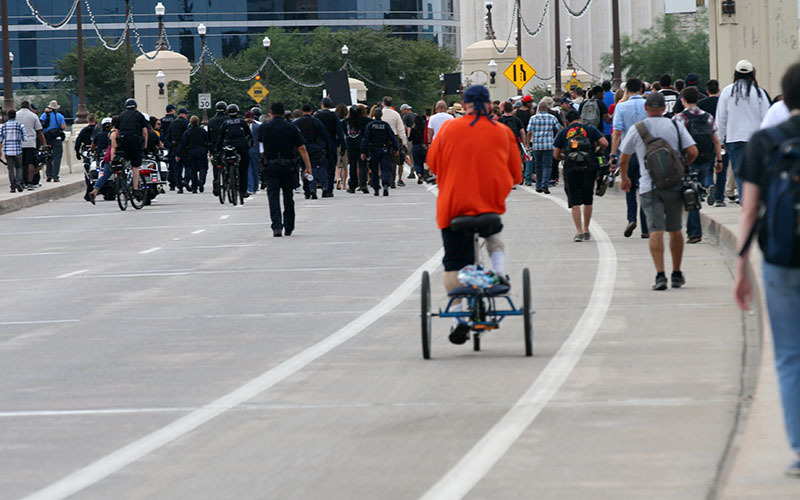 Jarrett Maupin led about 50 protesters across the Mill Avenue Bridge in Tempe on Monday, blocking traffic in what Maupin said was a protest of two police shootings of African-Americans in Arizona. 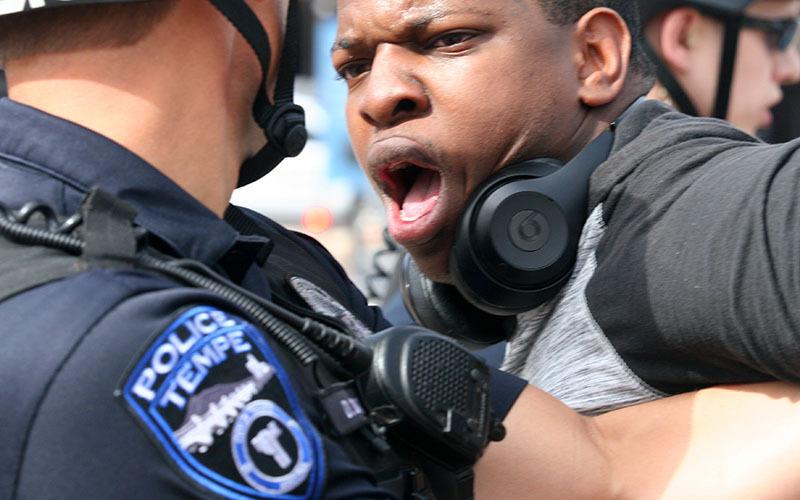 Echoing national concerns over police shootings of African-Americans, the diverse group of marchers in Tempe expressed outrage and voiced fear for their safety at the hands of police. “It’s not safe out here,” said a 23-year-old African-American woman wearing a Black Lives Matter shirt. She said it’s “open season” for African-Americans at the hands of police. 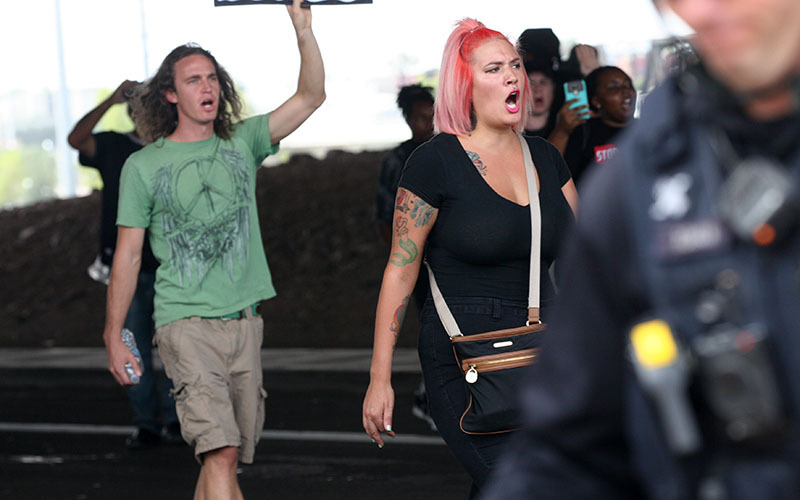 The protesters marched across the center of the bridge from Mill Avenue and then back again. The march took about an hour. The protest was generally peaceful, but police said Maupin and two others were arrested on misdemeanor charges related to blocking a public thoroughfare. If convicted, they could face up to 30 days in jail. They were also charged with failure to obey a lawful order of a police officer, another misdemeanor. Conviction could result in four months jail time. 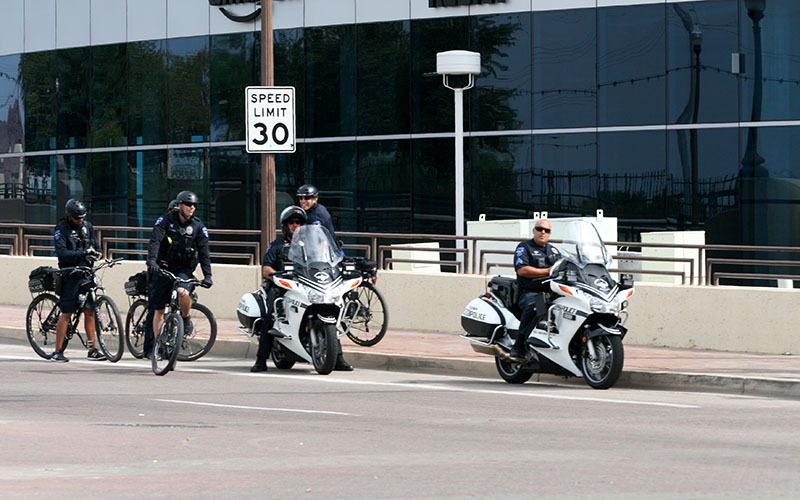 Tempe police officers rode motorcycles and bicycles, and accompanied the marchers on foot. They repeatedly ordered the protesters to move out of the road and onto the sidewalk. Protesters responded with chants of “Whose streets? Our streets!” and continued to walk down the middle of the road. 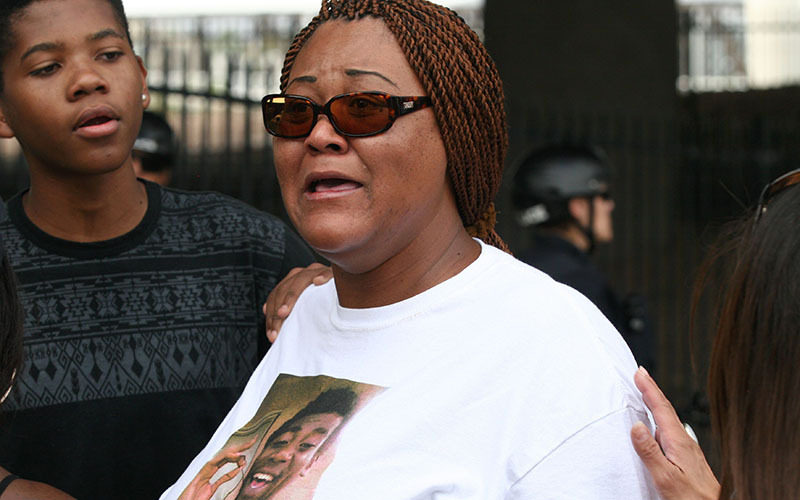 Before the protest began, the grandmother of 19-year-old Dalvin Hollins, who was shot in July by a police officer in Tempe, said the pain would never go away. Tempe police officials would not comment on the case Monday, but earlier news reports say Hollins was suspected of robbing a pharmacy. Hollins was shot in the back and did not have a gun, The Arizona Republic reported. “It could be anyone’s child,” said Sarah Coleman, the mother of Dalvin Hollins. Sarah Coleman screamed at police officers who arrested Maupin. Weeping, she clutched a framed black-and-white portrait of her dead first-born son, proclaiming her right to peacefully protest as she continued her walk down the bridge. She was joined by her husband Frederick Franklin, her son Devin Franklin, and various other family members and close friends during the march. The family said they have yet to receive sufficient details about the shooting. “Where is the shirt? Where is the gun? 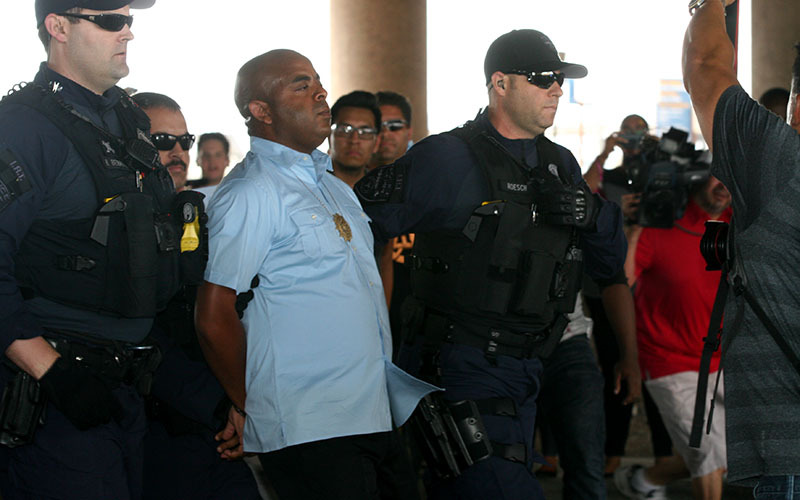 Police haven’t given us the answers, yet,” Sarah Coleman said. Maupin, a controversial activist, had earlier called for a criminal investigation of the shooting. Family members said Hollins would be proud of the march, and he was probably smiling down at them. Laveen resident David Griffen, 60, offered Hollins’ grandmother his motorized scooter as she struggled to walk. She said she didn’t want to leave her friends and family on the street, so Griffen rode on. 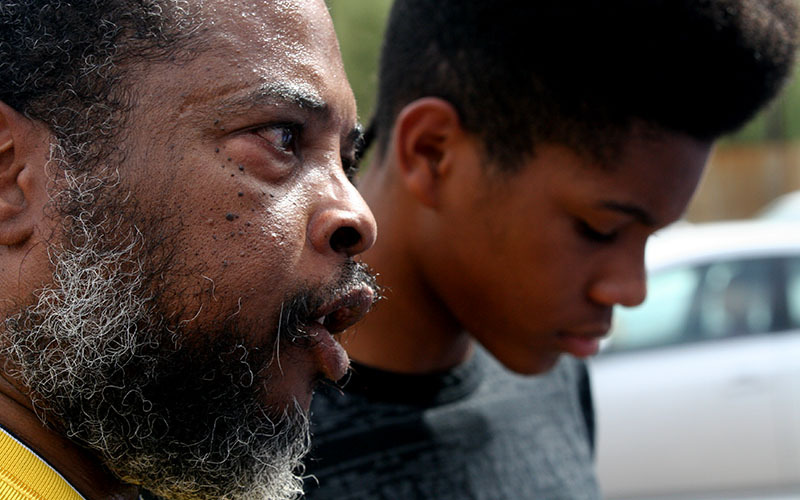 An African-American, he said he is concerned that his children would be shot by police. 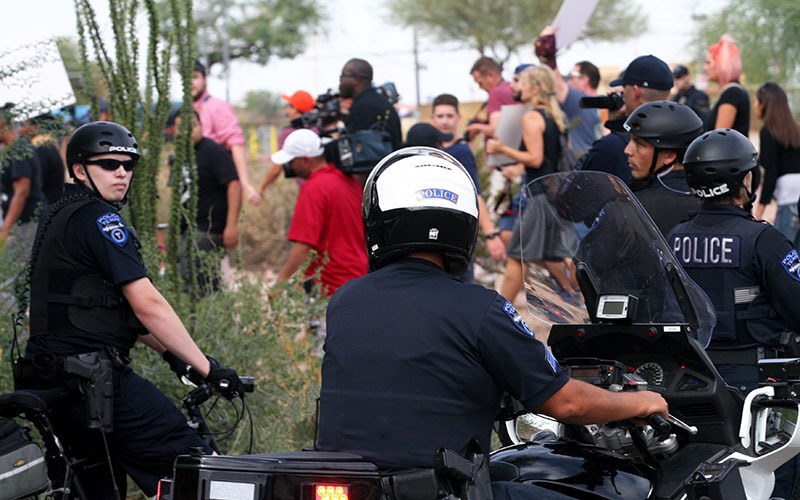 Tempe Police referred all questions about the march to their Twitter feed, which said Monday that three people were arrested during the march for obstructing a public thoroughfare, and there were no reports of injuries. Earlier in the day, a spokesman for the department, Rich Monteton, said that the police had been notified of the protest about two weeks ago, and while the group had a right to protest peacefully it was unlawful to obstruct a public thoroughfare.